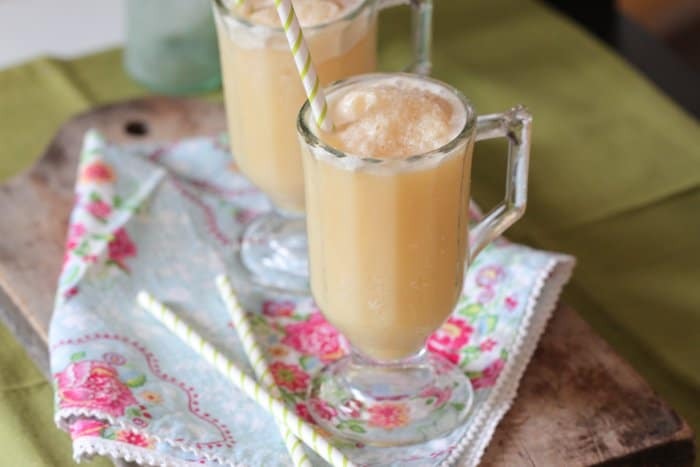 Who doesn’t love a good icy slushy refreshing drink in the summer? I know the boys and I do. Did I mention this one is good for you too? Win win, yay! 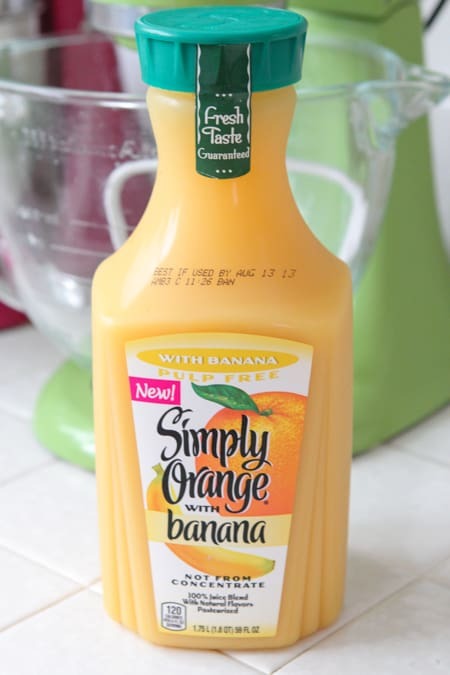 I am thrilled to be partnering with Simply Orange today to feature one of their new products, Simply Orange with Banana. Be sure to check out Simply Orange with Tangerine and Simply Lemonade with Blueberry new for Summer. We have been enjoying Simply Orange juices for years and appreciate their dedication to making a natural juice. Headquartered in Apopka, Florida, Simply Orange Juice Company is proud of the approach they take with our great-tasting 100% juices and juice drinks. Since the launch of Simply Orange® in 2001, they have been making orange juice simple, the way nature intended. Our not-from-concentrate orange juice has never contained added water, sugar or preservatives and is gently pasteurized to ensure that you always get a fresh-squeezed taste experience. Be sure to follow Simply Orange on Facebook. Simply Orange with Banana is blended with not-from-concentrate banana puree for a fresh taste experience with a tropical twist. 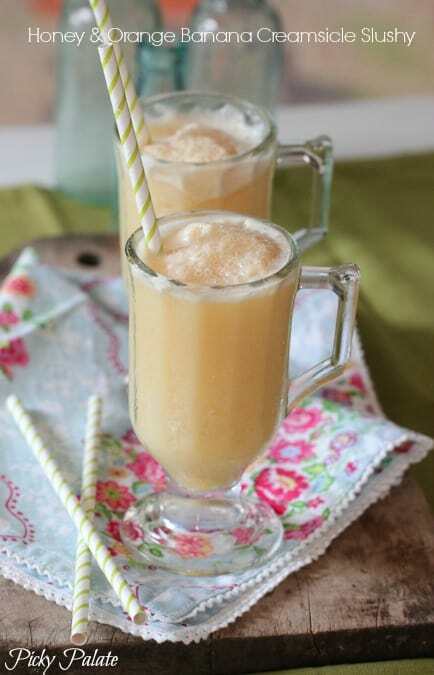 Wait until you try this juice in my slushy I’ve made for you today. So refreshing! My challenge today was to take one of my recipes on Picky Palate and update it using Simply Orange with Banana. I chose my Frozen Strawberry Milk Slushy. How perfect to use juice! It turned out amazing. 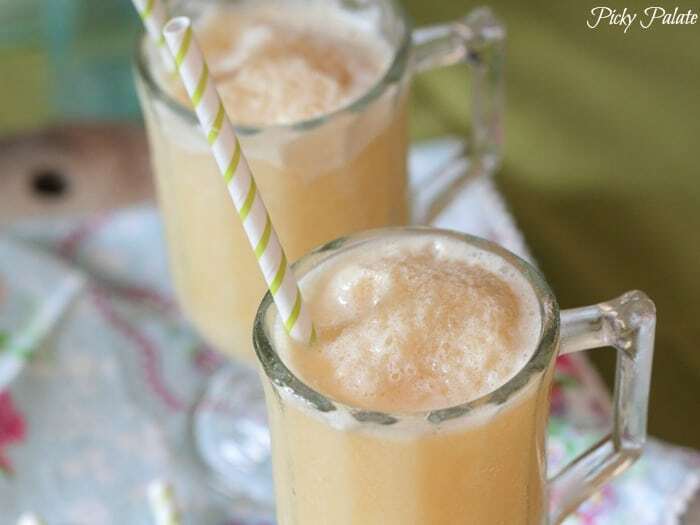 With only 5 needed ingredients, you’ll have this icy drink made in no time at all. Let’s take a look at how to make the slushy, shall we? 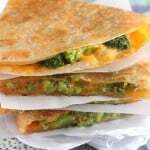 I love the simplicity of this recipe, just add your juice and almond milk to the blender. Continue adding vanilla, honey and ice cubes. 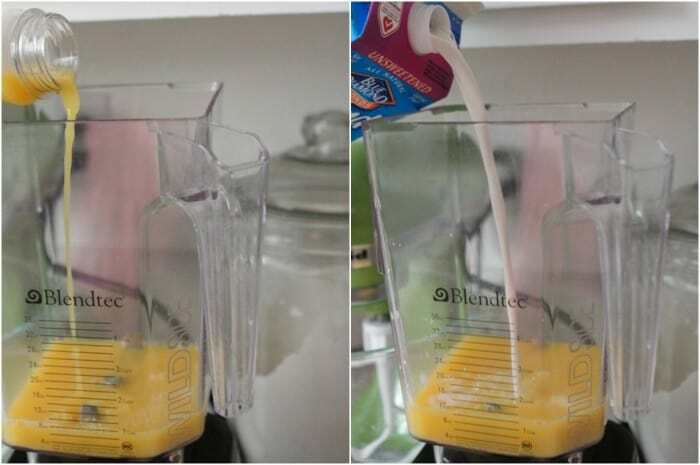 Give the blender a good 15 seconds or until ice cubes and in tiny pieces. Pour your icy drink into some glasses and get ready for a treat! 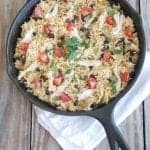 So excited for you to try this one! 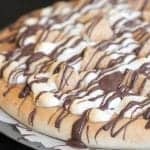 Add a fun paper straw and enjoy! 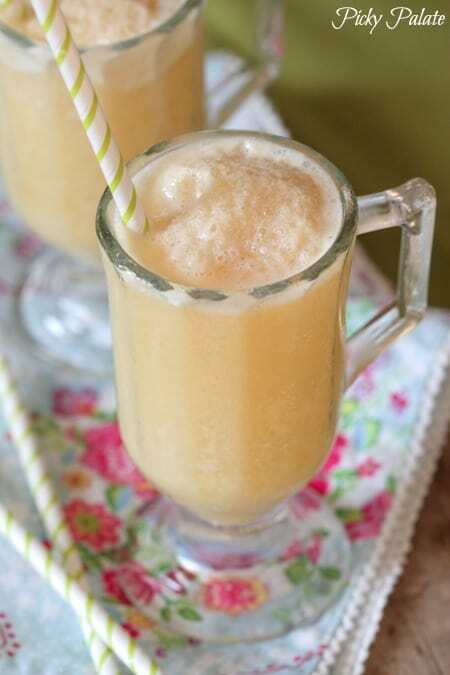 Perfect for summer and makes the perfect refreshing treat. 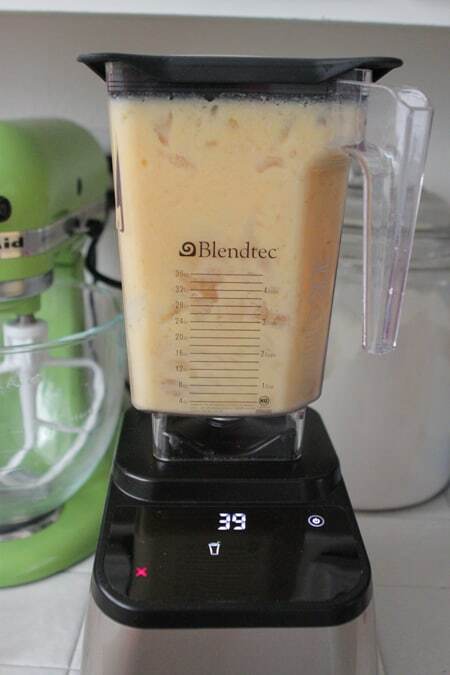 Place Simply Orange with Banana Juice into blender along with almond milk, honey, vanilla and ice cubes. 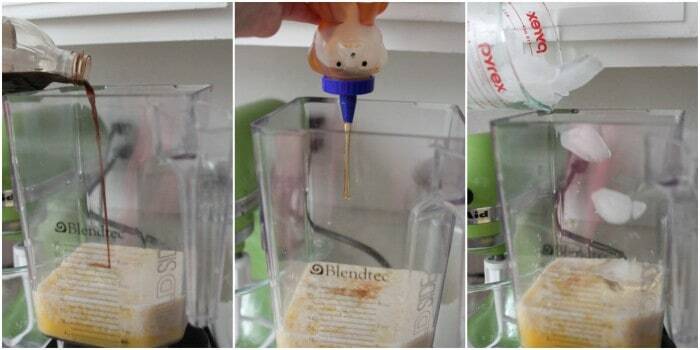 Blend for about 15 seconds or until ice is blended into small pieces. 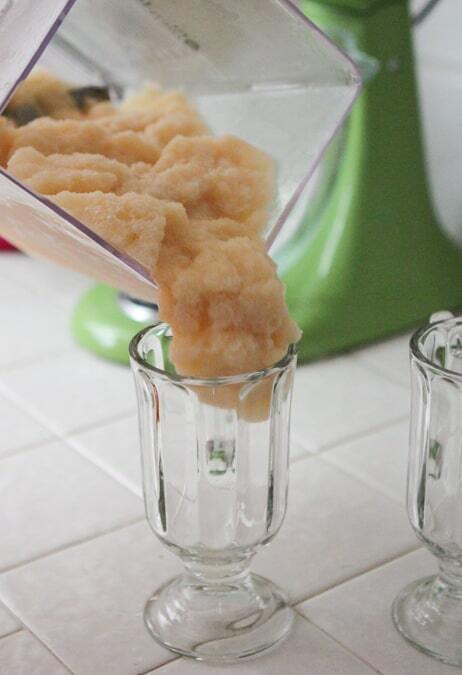 Pour slushy into individual glasses and serve cold. 3. Contest ends Monday July 29th, 8pm PST. Winner will be chosen by random drawing and be notified by email. Winner will have 48 hours to return email to claim prize. Disclosure: This is a sponsored post for Simply Orange, however thoughts and opinions are my own. But your drink sounds great b/c I ADORE bananas in smoothies and the banana juice sounds so good! Strawberry and banana is a fav. I liked and follow you and Simply Orange on Facebook! I follow Picky Palate on Facebook, and my two favorite flavors to blend are chocolate and peanut butter. You just can’t ever go wrong with that. But if I have to make it fruity and healthy… coconut and banana. Cantelope and basil…I know sounds weird but try some chopped basil on your next cantelope! I like pomegranate and blueberry. This sounds like an orange julius, yummy!! I would like to see Strawberry and Blueberries. I follow Simply Orange on FB. YES! Everyone would love me to death is I made a big batch of these. Perfect summer drink! I blend spinach and blueberries in my morning smoothie – I get in my greens and it’s still sweet and delicious. 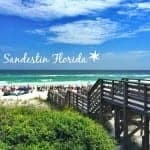 I’m one of your FB followers too. I don’t do Facebook but if I did, I would LIKE Picky Palate and Simply Orange! Meant to say Simply Orange too. I love cherry and lime or strawberry and lemon! They’re so refreshing in the summertime. My favorite to blend is strawberry and peanut butter! I love orange and banana! I like to blend pineapple and coconut together! U love blending orange juice with pomegranate and a little seltzer water with blended ice. Super refreshing in the summer! I would love to see mango and coconut combined!! Pomegranate would taste yummy! Pineapple would be refreshing. I love the Simply Raspberry Lemonade!! I liked simply orange and picky palate on FB! I love to have a Blueberry and Cranberry Slushy, Maybe try Orange Juice in the mix. Definitely chocolate and peanut butter! Mango and Peach I just combined yesterday, I think this might be excellent to mix with the orange and banana this week. Im a fan of yours on Facebook and a subscriber. HOwever this strawberry basil I think I might try. I wonder what proportions are ideal. Must get some strawberries today and try. I like Simply Orange Juice and you on Facebook. I love melon and blueberries mixed together. I think cantaloupe, cassaba melon, and blueberries mixed in a smoothie would be delicious! OOOOOHHHHHHH this sounds so refreshing…wish we had one right now. I already “like” picky palate on Facebook. I love strawberry and banana mixed together. Also, cherry and lime. So refreshing and delicious during the hot summer months!